Kat - Also at the symposium, we heard from another pioneer of biology - Shinya Yamanaka, who won a Nobel prize for his discovery that just four molecules could convert any type of adult cell back into so-called induced pluripotent stem cells, which have the ability to become any type of tissue. And, as he explained to me, his research was directly inspired by Dolly. Shinya - So, I was a physician a long time ago. I couldn't help many patients suffering from intractable diseases, including my own father. So that was why I changed my career from physician to a scientist. Because I thought, I believe it is basic medical science which in the future can help those patients suffering from intractable diseases. I did not expect I would work on stem cells when I started my scientific career. But because of many unexpected results of my experiments, I became interested in stem cells and here I am now. Kat - So we're at the 20th birthday party I suppose for Dolly who was a sheep who was created by taking an adult cell, putting it into an egg cell, and then you could make a sheep. What did that tell us about cells that we didn't understand before? Shinya - So Dolly really surprised us how flexible our cells are. Previously, we thought cell differentiation as irreversible. Kat - Just one way - you go from egg to animal and that's it. Shinya - Exactly. But because of the success of Dolly, we learned that it's not true. Differentiation is reversible. They can go back to the embryonic state. So by being inspired by Dolly, I started a project in which I tried to make embryonic stem cell-like stem cells. Not from human embryos but from adult somatic cells. Kat - So, how did you start doing that? You've got these adult cells in a dish, you're looking at them going, "Okay, what do I do to you?" Shinya - There was another previous work in which a scientist converted skin fibroblasts into muscle cells just by one factor. The factor is myoD. It's a transcription factor. By simply putting myoD, that factor into fibroblasts, Dr Weintraub was able to convert fibroblasts into muscle cells. So, that was another important lesson to me. We could convert cell fate by transcription factors. And also from Dolly, we learned that we should be able to reprogram cells back into the embryonic state. So, it's a combination of the two great previous studies which promoted me to initiate this project. Kat - Because transcription factors, these are the molecules that basically turn certain genes on. They sit on the DNA, they turn genes on. So you've got that part of the puzzle, then you've got the Dolly part of the puzzle that tells us that you can go from one to the other. So then you just have to find the factors. How did you find those four factors, your Yamanaka factors that can turn adult cells back into stem cells? Shinya - So, I thought those factors that can reprogram cells back into the embryonic state - ES cells. they should play important roles in ES cells themselves. So in the first 4 or 5 years in this project, I spent most of the time to identify as many factors as possible that played important roles in mouse embryonic stem cells. so then we just combined multiple factors which we had at that time and test them, and luckily, we were able to identify those four factors. So, it was a combination of our hardwork and our good luck. Kat - How did it feel when you looked in that dish for the first time and you were like, "This has worked!" Shinya - Actually, we thought it must have been some kind of mistake - some contamination or some kind of error. So, we repeated the same experiment many times and it worked always. So then we were convinced it must be true. Science is very tough. In many cases, we found we did something wrong. So, in this very special moment, we couldn't be just happy. We were very careful. Kat - Something's got to be bad somewhere. Shinya - So actually we didn't toast. Kat - You did some toasting maybe when you got your Nobel Prize for it? Shinya - No, not yet. When we become able to help patients, that's when we're going to have some good wine. Kat - So you mentioned helping patients because now, we can take adult cells, you could take say, a skin cell from you or from me, you can treat it with these factors, you can turn it into stem cells. and then what can you do with them? What sort of cells can you make from these iPS cells? Shinya - So at least in theory, we can make any types of cells that exist in our body like brain cells, heart cells, liver cells. So the potential is enormous. Of course at the moment, it is still very difficult to make completely mature heart cells or liver cells from iPS or ES cells but many scientists have been working very hard. I really hope in the very near future, we can do it. Kat - I see some things like using 3D printing with tissues, with cells. is that the sort of thing you could do with iPS cells as well one day. Shinya - It's also possible. So, we could use like heart cells, muscle cells, other types of cells as inks of 3D printers. At the moment, it's still like a scientific fiction but after 10 years or 20 years, who knows? It may be possible. Kat - Another thing that maybe seems like science fiction is that certainly in mice, we can take iPS cells and we can make germ cells. we can make eggs and sperm. Again, is that something that could happen in the future, your mummy and daddy could be skin cells? Shinya - It's possible but again, we need to discuss with not only between scientists but also with the general public, and also couples suffering from infertility, regarding how much we can do our research. So our goal is to help patients but scientists alone cannot decide how much we can proceed. So it's a very naïve question. Kat - I went to university and that first year was when the announcement was made about Dolly the sheep so my whole adult life as a scientist has been an incredible time. How does it feel to be working at the cutting edge of such an incredible and exciting field? Shinya - Well, that's one of the reason why we do science. Science is full of surprise. It's unpredictable. In many times, it's very tough. Scientists are having a hard time almost every day but sometimes it gives us wonderful moment. So that's why we cannot stop doing science. That's the beauty of science. 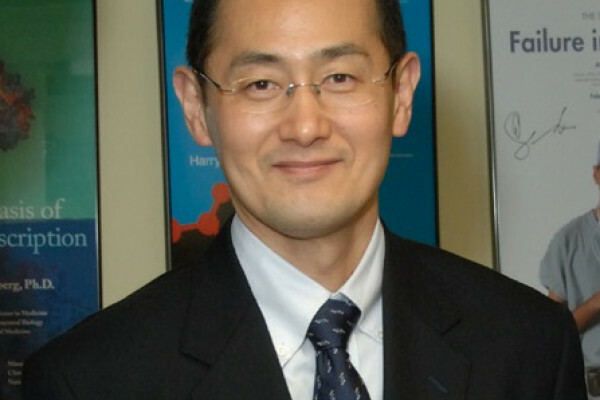 Kat - Nobel Laureate Shinya Yamanaka, from the Centre for iPS Research and Application in Kyoto.